Magazine articles are full of inspiration, and trends that help define what a beautiful home environment looks like. But your home should always be an expression of your own unique taste and values to feel comfortable. If money were no object, we would all be relaxing in the kind of living rooms and bedrooms that we see celebrities enjoy. But in the real world, the furnishings and accessories that we choose are infinitely impacted by our own budget. 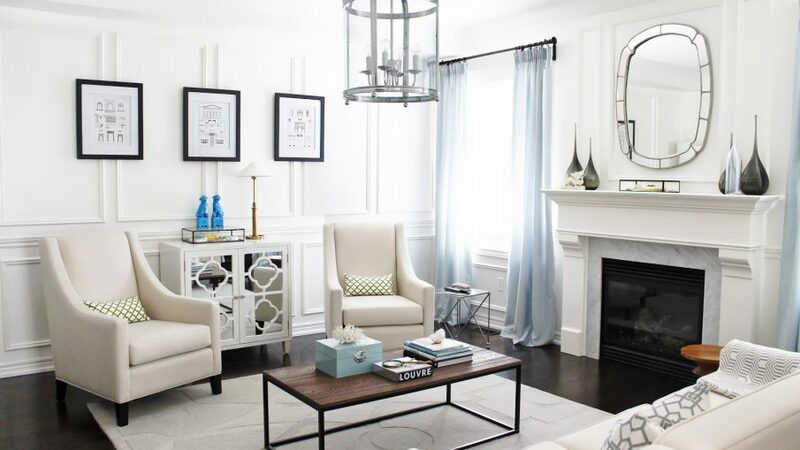 Does a lower budget for home décor limit the aesthetic and potential of your space? Interior designers are experts at creating the looks that you crave for your home, at a fraction of the cost, and you can too, by borrowing from professional home design tips. Did you know that the interior design of your bedroom can impact quality of sleep? Everything from the color scheme you choose, to the number of furnishings and storage elements can either support relaxation, or create a crowded bedroom that distracts from a restful night of sleep. The color and palette of your bedroom paint has a dominant influence on the mood, energy level and feeling of serenity that is needed to support quality sleep. Red triggers adrenaline production, raises blood pressure, and is not the best choice for bedroom design, including for wall paint, accessories or bedding. Yellow stimulates feelings of alertness and being awake, and is not appropriate as a bedroom color choice. Researchers have indicated that blue helps to lower blood pressure and slow down heart rate, and contribute to calmness. It is an ideal color for bedrooms and spa bathrooms. Green has been cited as the most restful and relaxing color to the eye, mind and body, and is a perfect choice in many bright hues, for bedroom designs. Deep purple (think eggplant or aubergine), is rich and luxurious, and is a relaxing accent color for bedroom themes. Purple offers many of the same physiological and visual benefits as blue, but with a temperately warmer feel. White, while clinical feeling, is refreshing and helps by removing the distraction of color and texture in the bedroom, for a restful night of sleep. Thinking of adding plants to your bedroom? Be aware that certain types of plants can be hazardous to your health, as they release carbon monoxide into the air at night. Other plants however, release oxygen at night, and are proven natural filters that can improve the air quality of your bedroom, and enhance rejuvenating sleep. For a professional theme in your bedroom, select relaxing neutral colors, and keep clutter to a minimum to promote healthy sleep patterns. Avoid wall-mounted televisions, and keep electronics out of the bedroom, for a stylish retreat that will look good, and rejuvenate nightly. In urban environments, the cost per square foot to own or rent a home is high, which means that most homes are tight on space. One of the most overlooked areas for both storage and aesthetic appeal are the walls of your dwelling, which can be innovatively designed to help provide organization and artful expression. If your space is small, interior designers recommend that you scale your wall mounted art and décor items accordingly. For instance, a small room with a low ceiling can be made to feel and look even smaller, if it is overwhelmed by too many wall-mounted accents, or if they are too large. It is not a matter of having less, but ensuring that you are sizing your wall-mounted accessories appropriately, so that they add depth to your décor, and visual engagement. Check out these style tips for utilizing wall space, via the design experts from HGTV. Anyone can order brand new lamps, tables, framed artwork and other important artistic accessories, but the real fun starts when you begin to look for accents that aren’t mass produced. You can create a refreshing, deeply individualistic theme in your home, apartment or condominium by hunting thrift shops, estate sales or other “off the beaten path” sources for original pieces, at an affordable price. Have you ever walked into a professionally designed space, that seems to have a spot for every activity throughout the day? Reading nooks, conversation chairs (away from the television) and other touches can elevate your interior décor, and add more functionality and pleasure to your space. Open concept spaces can be the most challenging interiors to design, without creating clutter. If you wish to define formal conversational spaces or study and work areas, you can utilize luxury area rugs to create the same illusion as walls or dividers. Floor rugs are a practical, easy way to divide space by purpose, per designers at our favorite rug store in San Diego. To use an area rug to define a specific space, coordinate the rug with accent colors from the furnishings that will be in direct contact with the rug, to create a theme. For instance, if you incorporate an Asian rug with a burgundy base, furnishings do not need to match exactly, but should have similar tones in the upholstered fabric, to tie it all together. Another way to create that visual color cohesion, is to add toss pillows that pull from the base palette of the rug; the eye will register the color coordination for a polished effect. There are many do-it-yourself (DIY) resources available on Pinterest to help build, or repurpose existing furnishings or accessories. Upcycling some of your favorite pieces, or augmenting them with a fresh coat of finish or new upholstered seat panels, can refresh your space while minimizing expense.